Anne Bradstreet Research Papers look at the life of this puritan woman, and how her literary pieces explore it. In a time when Puritan literary works were based almost solely on the purpose of moral instruction, Anne Bradstreet pioneered the concept of weaving personal feelings into the moralistic threads of poetic verse. Intrinsically, however moral righteousness and honest human emotion are contradictory. 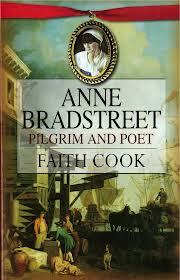 Therefore, Anne's voice of Puritan faith often conflicted with her personal experiences and perceptions. The contrast between Anne's deeply embedded moralistic ideals and her emotional reactions to the harsh realities of her personal traumas and failures is apparent throughout the majority of her 17th century lyric poetry. As daughter to the Earl of Lincolnshire at William Shakespeare , Anne received a superior education in the noble households in which she was raised and was quite firm in her religion. She married and bore eight children and continued to live the lifestyle of a "good Puritan woman". However throughout many of her works, Anne begins to question how honest she is being about her faith and feels distress over her inability to live up to the incredibly high standards placed upon her. An epitomic illustration of this inner struggle is depicted in Anne's 1678 poem, The Author To Her Book. Throughout this work, Anne explores the dissension between her innate need to love and accept her child unconditionally, and her ingrained desire to portray him to others as flawless, in both beliefs and behaviors. Lines 3 and 4 proclaim “ Till snatcht from thence by friends, less wise than true, Who thee abroad exposed to public view...” Although part of the Puritan doctrine enforces a deep reverence for responsibility and honesty, at this point in the poem, Anne is solely blaming societal influences for her child's shortcomings. Yet later in the verse, she questions her own contributions to her child's failures... (Lines 13-16) “I washed thy face, but more defects I saw, And rubbing off a spot, still made a flaw. I stretch thy joints to make thee even feet, Yet still thou run'st more hobbling than is meet.” Anne feels publicly and personally humiliated by her inability to raise a perfect child despite her intense righteousness. In fact, she feels so distraught over her child's public image, she actually suggests in lines 21-24 that her child should lie about his parentage to avoid tarnishing Anne's reputation any further. Analysis of In Reference to Her Children essays look at Anne Bradstreets poem about her children, and the symbolism it portrays. Research papers on famous authors can be ordered from Paper Masters. Any author, any topic, you direct our writers to write a custom project. Paper Masters writes custom research papers on Anne Bradstreet and look at the life of this puritan woman, and how her literary pieces explore it.